The red-banded hairstreak, Calycopis cecrops (Fabricius), is a very attractive butterfly and is one of our most common hairstreaks throughout the southeastern United States in dry open woods and wooded neighborhoods. 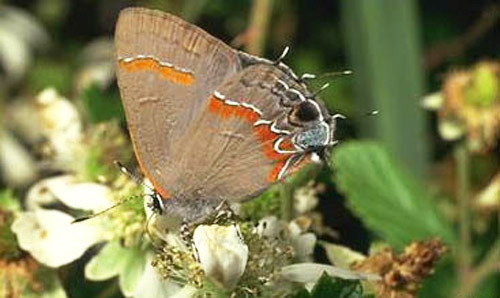 The redbanded hairstreak is found from Maryland to southeast Kansas to eastern Texas and throughout Florida. As a stray, it is occasionally found as far north as southern Wisconsin and Minnesota. Adults: The wingspread of the adult is 24 to 30 mm (15/16-1 3/16 inches) (Opler & Malikul 1998). The under surface of the wings is gray-brown with a postmedial white line edged with a bright orange to red-orange band. Each hind wing has two tails (hairstreaks) with a relatively large conspicuous eyespot on the wing margin between the bases of the tails (Figure 1). Figure 1. Adult red-banded hairstreak, Calycopis cecrops (Fabricius). Photograph by Jerry F. Butler, Entomology and Nematology Department, University of Florida. 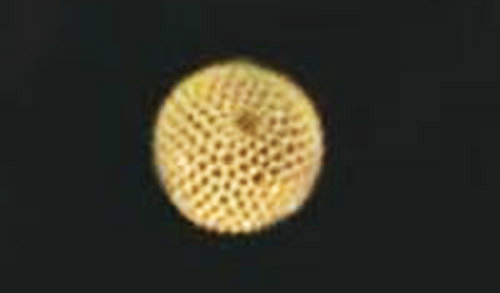 Eggs are dimpled white turning to tan as hatching approaches (Figure 2). Figure 2. Egg of the red-banded hairstreak, Calycopis cecrops (Fabricius). Photograph by Jerry F. Butler, Entomology and Nematology Department, University of Florida. Larvae: Full-grown larvae are up to 0.6 inches in length (Minno et al. 2005) and are brown with a median dorsal longitudinal stripe and covered with a coat of short hairs. Spiracles are conspicuous as dark submarginal spots on the prothorax and abdominal segments one through eight (Figure 3). Detailed descriptions of all instars are given by Rawson et al. (1951). Figure 3. Larva of the red-banded hairstreak, Calycopis cecrops (Fabricius). Photograph by Jerry F. Butler, Entomology and Nematology Department, University of Florida. 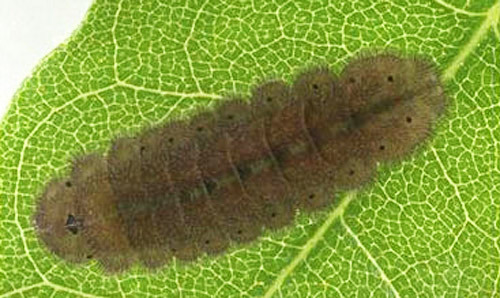 Pupae: Pupae are hairy and are light brown mottled with darker brown or black (Figure 4). Figure 4. Pupa of the red-banded hairstreak, Calycopis cecrops (Fabricius). Photograph by Jerry F. Butler, Entomology and Nematology Department, University of Florida. There are several flights (May-October) in the northern part of the range and year round in Florida. Larvae or pupae overwinter (Opler & Krizek 1984). As with the other hairstreak butterflies, perching adults move their hind wings up and down. The tails on the hind wings with their associated eyespots resemble a head. The movement of the tails is believed to attract a potential predator's attention to that part of the wings which then is torn away allowing the butterfly to escape. This “false head” defense has been documented to be effective against the attacks of jumping spiders (Sourakov 2013). 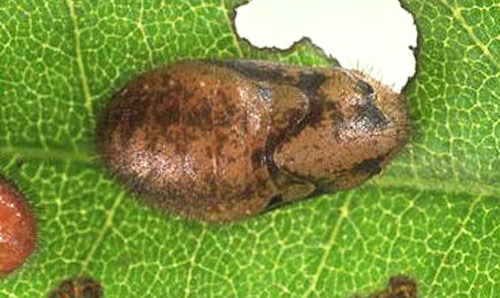 Eggs are laid on the undersides of dead leaves on the ground beneath the host plants. Larvae are reported to feed on dead leaves and detritus in the leaf litter (Minno et al. 2005, Opler & Malikul 1998). Males perch on vegetation to await the arrival of females for mating. Adults feed on nectar and sip from mud. In the laboratory, larvae have been reared on bayberries (Myrica spp.) 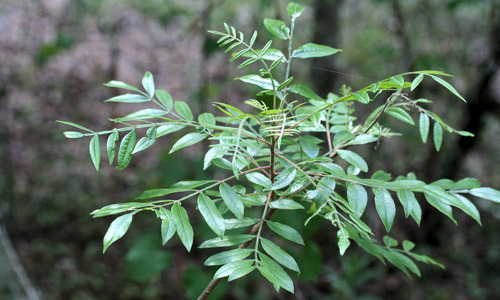 (Figures 5 & 6) and sumacs (Rhus species) (Figure 7) (Gifford & Opler 1983, D.W. Hall, personal observation, Rawson et al. 1951). Figure 5. 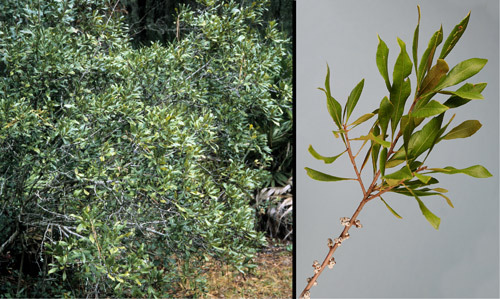 Southern bayberry or wax myrtle, Myrica cerifera L. (Myricaceae), bush (left) and close-up of branch with berries (right). Photographs by Donald W. Hall, Entomology and Nematology Department, University of Florida. Figure 6. Winged sumac, Rhus copallinum L. (Anacardiaceae). Photograph by Donald W. Hall, Entomology and Nematology Department, University of Florida. Gifford SM, Opler PA. 1983. Natural history of seven hairstreaks in coastal North Carolina. Journal of the Lepidopterists' Society. 37: 97-105. Opler PA, Krizek GO. 1984. Butterflies East of the Great Plains. The Johns Hopkins University Press. Baltimore, MD. Opler PA, Malikul V. 1998. Eastern Butterflies. Peterson Field Guide Series. Houghton Mifflin Company. New York. Rawson GW, Hill MH, Hessel SA. 1951. The life history of Strymon cecrops Fabricius (Lepidoptera, Lycaenidae). Bulletin of the Brooklyn Entomological Society 46: 79-84. Scott JA. 1986. The Butterflies of North America. Stanford University Press. Stanford, CA. Publication Date: August 1999. Latest revision: December 2016.